The nervous system creates memories (also called neurosignatures or neurotags) to organize our experiences in our filing cabinet we all call the brain. 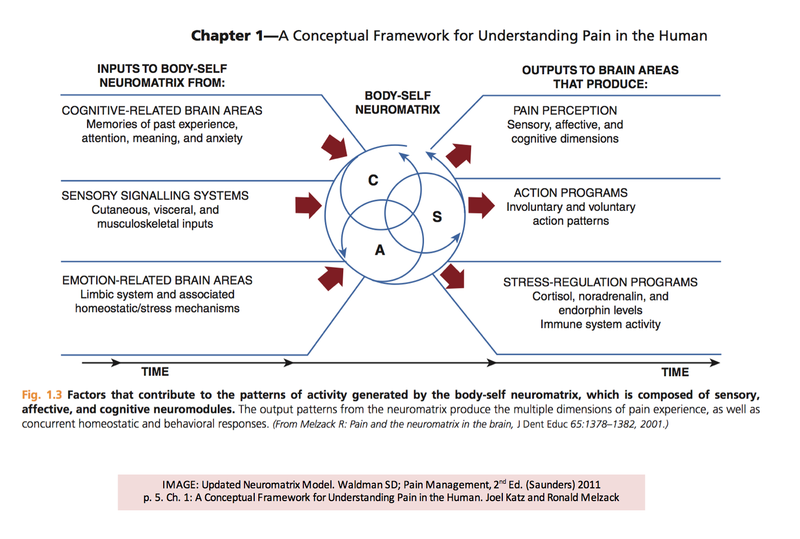 In the textbook “Explain Pain” by David Butler, a neurotag consists of the interconnection of various parts of the nervous system to produce an output. The output defines the neurotag. This output is created by the body-self neuromatrix that was discussed in the History of Pain Science Section. Please remember that pain is an output from the brain and has its own neurotag. 1. When driving to work, you may take highway 22 and exit main street five days a week to go to work. Then on a random weekend, you decided to drive that same highway but need to exit one street sooner. What commonly occurs and that you end missing the exit and go on the same route that you take to work. Highway 22 and exiting onto main street is part of the neurotag of going to work. 2. Have you ever listened to a song that instantly reminded you of an ex-boyfriend or girlfriend? You might change the radio to another song because you do not want to be reminded of that person. The song is attached to the neurotag of that person. Songs are often attached to various memories or neurotags such as movies, events, and emotions. 3. The scent of a dessert that reminds you of your grandma’s kitchen. You can even feel the emotions that you felt as a kid and for a moment your body has a flashback to your past as your grandma would give you her favorite dessert. 4. 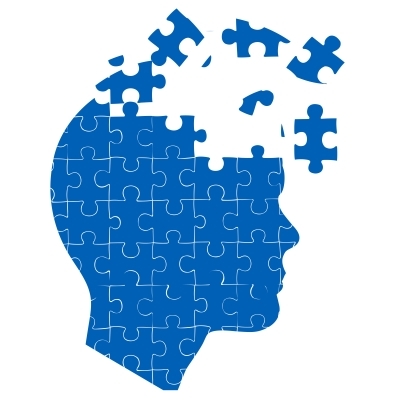 Rainy and damp weather can also be part of a pain neurotag. There was a research study that compared people who injured their knee during cold damp weather and people who didn’t. I think you know where this is going. People who injured their knee in cold and damp weather experienced increased pain when it was cold and damp. This can be due to the activation of the pain neurotag from that type of weather. Researchers have found that pain and weather have no relationship. But many people do have pain when the weather changes and this can be explained by the concept of neurotags. 5. When you see someone fall and get hurt or if you see someone get a shot at the doctors office, it may trigger negative emotions or a painful response. This is due to the activation of the pain neurotag. 6. Have you heard of Pavlov’s Dog? In 1901 Ivan Pavlov, PhD, a physiologist and his assistant Ivan Filippovitch Tolochinov found that feeling a dog will promote salivation. Then they rang a bell while feeding a dog over and over. Eventually ringing the bell without any food triggered salivation. This was defined as a conditioned response. Regarding neurophysiology, it is called a neurotag for salivation. Even without food, the bell itself triggered salivation. Pain is the same way. When there is an injury, there is often a pain response. For example, if there is a knee injury there may be pain. What also happens when there is an injury is that movement also triggers pain. Then every time you do a specific activity such as a squat there is increased pain. After 6-8 weeks, the tissues have generally healed, but the movement can still trigger pain due to the conditioned response or relationship of the pain neurotag with that specific movement. Understanding that pain can be associated with a neurotag helps with treatment. Since emotions can also be connected to pain neurotags, it is possible to feel emotional during treatment. While a clinician is performing a hands-on technique to your body or if you are performing movements similar to your injury, you may feel like crying, feel upset, or become anxious. This is common. When emotions are connected to pain, seeking guidance from your physician regarding a referral to a health care provider may be beneficial From a physical therapy standpoint, movement without triggering pain and negative emotions will create new movement neurotags that can dampen, block, and minimize the pain neurotag. Many will say that muscles can store emotional and movement memories, but in order for any body part to store a memory, it requires nerves and brain cells. So the only part of the body that can store memories is the brain, therefore muscle memory may actually be brain memory stored as the neurotag for that activity. 1. Click on the image below and print it out. 3. Now that you have filled the boxes with various data, fill in the center of the grid with an important event that has occurred in your life. Now imagine if every item you described is now “neuro-tagged” to your experience. The arrows indicate that everything is interconnected by the nervous system. Every event, movement, memory, and etc is processed as a neurotag. Essentially, there is a neurotag for every single thing we do and experience. This exercise that you complelted is a simpler form of the diagram below that describes the Neuromatrix Model. 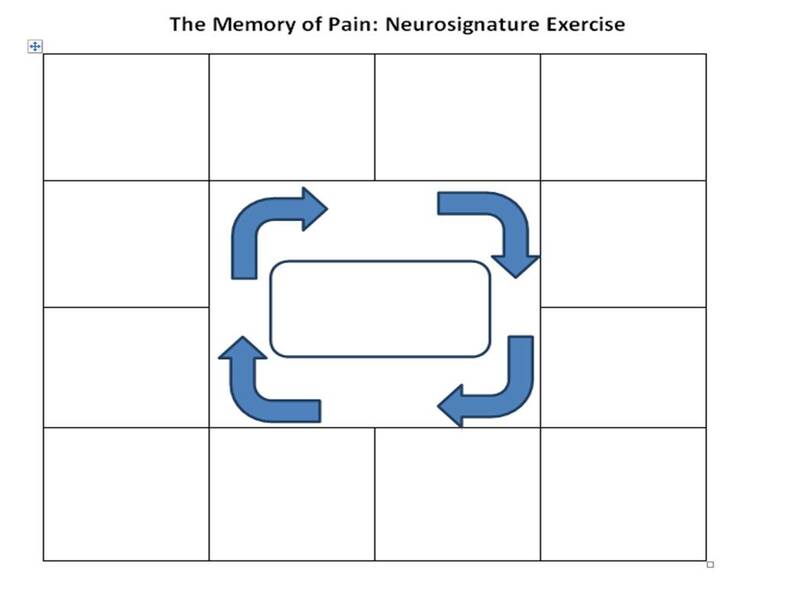 Feel free to read the section on “Self Correction from a Painful Experience” to understand how various motor control exercises as well as brain exercises can change your pain neurotag. Technically, any movement that positively stimulates your nervous system has the potential to improve your symptoms as you create new neurotags and cover up the painful one. Now go and stimulate your nervous system! Bushnell MC, Ceko M, Low LA. Cognitive and emotional control of pain and its disruption in chronic pain. Nat Rev Neurosci. 2013 Jul;14(7):502-11. doi: 10.1038/nrn3516. Epub 2013 May 30. Review. PubMed PMID: 23719569.